To join you only need to pray these two prayers in the morning. Saint Michael, God's Greatest Angel, you gave God the glory, God gave you the power to defeat our enemies, especially Satan. Please place all the Warriors' petitions and mine (State your petition) before the throne of God and intercede for us. Saint Michael rise with your legion of angels and defend your Warriors. and Throughout the day whenever you feel the need for even more protection you can pray this short prayer. "But next to him was Cpl. Christopher Ahrens, who quietly mentioned that two bullets had grazed his helmet the day the Marines attacked Marjah. The same thing, he said, happened to him three times in firefights in Iraq. Cpl. Ahrens, 26, from Havre de Grace, Md., lifted the camouflaged cloth cover on his helmet, exposing the holes where the bullets had entered and exited. He turned it over to display the picture card tucked inside, depicting Michael the Archangel stamping on Lucifer's head. "I don't need luck," he said." For conspicuous gallantry and intrepidity at the risk of his life above and beyond the call of duty as a Hostage Rescue Force Team Member in Afghanistan in support of Operation ENDURING FREEDOM on 8-9 December 2012. As the rescue force approached the target building, an enemy sentry detected them and darted inside to alert his fellow captors. The sentry quickly reemerged, and the lead assaulter attempted to neutralize him. Chief Byers, with his team, sprinted to the door of the target building. As the primary breacher, Chief Byers stood in the doorway fully exposed to the enemy fire while ripping down six layers of heavy blankets fastened to the inside ceiling and walls to clear a path for the rescue force. The first assaulter pushed his way through the blankets, and was mortally wounded by enemy small arms fire from within. Chief Byers, completely aware of the imminent threat, fearlessly rushed into the room and engaged an enemy guard aiming an AK-47 at him. He then tackled another adult male who had darted towards the corner of the room. During the ensuing hand-to-hand struggle, Chief Byers confirmed the man was not the hostage and engaged him. As the other rescue team members called out to the hostage, Chief Byers heard a voice respond in English and raced toward it. He jumped atop the American hostage and shielded him from the high volume of fire within the small room. While covering the hostage with his body, Chief Byers immobilized another guard with his bare hands, and restrained the guard until a teammate could eliminate him. His bold and decisive actions under fire saved the lives of the hostage and several of his teammates. By his undaunted courage, intrepid fighting spirit, and unwavering devotion to duty in the face of near-certain death, Chief Petty Officer Byers reflected great credit upon himself and upheld the highest traditions of the United States Naval Service. On my first deployment to Iraq some eleven years ago, I arrived in country and I saw another SEAL standing there with a St. Michael the Archangel patch on his shoulder. I’m not sure what drew me to it, but I walked up to him and asked him if I could have it. He was leaving the combat zone and made it through a safe deployment, so he was absolutely willing to give it to me. He handed it to me without hesitation. I’ve worn that patch on my kit on every single mission I’ve ever been a part of, and I prayed the St. Michael prayer while moving in the toughest missions I faced. And it does start by saying, “St. 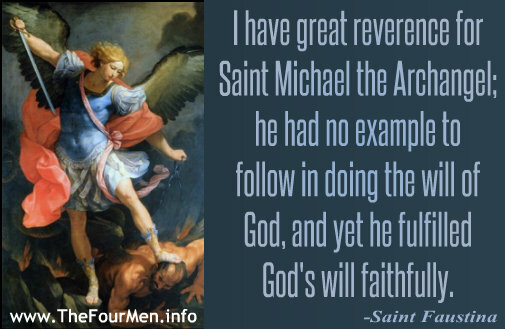 Michael the Archangel, defend us in battle and be our protection.